The telephone box in West Buckland lost its telephone in about 2012, and was bought by Thurlestone Parish Council for a token sum. It has been managed by the current Caretakers since December 2014. What we took on was a dirty box, which needed painting, had 3 window panes that were plastic, rather than glass, and a door that did not close properly. With it came some red Hammerite paint, and 3 panes of glass, that the previous caretaker had obtained from BT. We were anxious to keep the Box, as it is the only land mark in the centre of Buckland, and we decided that we should use the Box as a resource centre for our village. We asked the Parish council for a grant, so that we could get the Box painted professionally, and they have generously given us 2 grants - one of £200, and a second one of £300. It has now been painted inside and out, the 3 panes have been replaced and we have a notice board, with some emergency numbers on it, and plenty of space for other numbers. We have a magazine lending shelf, and surplus seedlings and plants are being left in the Box, and are soon spirited away by new owners. We trialled a vegetable swap system in the summer on a table outside the Box, so that people left their surplus home grown vegetables for others to eat, rather than putting them on their compost heaps. We have had several social events - the first after the Village Carols in December 2014, when we served mulled wine and mince pies in drizzle to about 30 people, and the second on Easter Saturday 2015 when 90 people turned up for coffee and cakes, with an Easter trail for the children. We had a Pimms picnic in August 2015, when we served Pimms and delicious cakes, made by Nitca Milburn-Fryer, and families brought picnics to eat in the very pleasant surroundings of Peter Hurrell’s field. Again, about 90 people attended. In September 2015, we had an apple pressing on a beautiful morning in Peter’s field. Apples arrived from local gardens and orchards, and people chopped, squashed and then pressed them in Gillie and Gordon Southcott’s apple press, and we went home carrying bottles of delicious apple juice. Just before Christmas 2015, we had a Christmas party, whose venue was hastily changed from the Buckland Box to Nitca and Paul Milburn-Fryer's house due to a bad weather forecast, and we enjoyed mulled wine and Nitca's cakes and mince pies. On Good Friday 2016, we had an Easter party with a trail for children in the woods, led by the White Rabbit aka Carey Ryan-Carter, which was enjoyed by everyone on a glorious spring day - see photos below. Coffee and tea, and Nitca's cakes were served. The date was changed because of impending bad weather on the Saturday, when we had intended to hold it. It was a good opportunity for everyone to see the newly installed defibrillator in the Box. The Buckland Box has its own Facebook Page (see here), with photos of our events on it. As West Buckland has no mobile phone coverage, perhaps what we also really need is an emergency phone….! The Buckland Box now has an AED - an automatic external defibrillator supplied by the British Heart foundation, who have been given £1 million by the Department of Health, to provide communities with a defibrillator. The BHF have also given us an alarmed cabinet and teaching materials, consisting of 10 inflatable mannequins and DVDs which teach CPR and the use of an AED. If anyone would like to borrow a DVD and mannequin, please email annacmrtin@gmail.com or phone 01548 560796. 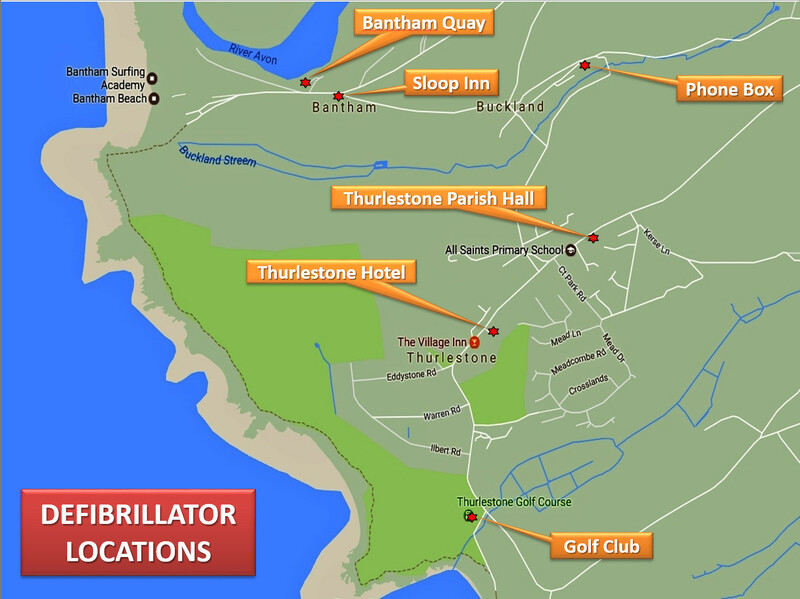 We had a presentation on the 4th February 2016 by the Heartstart team from Kingsbridge Estuary Rotary club on the use of the AED and resuscitation - see the report and photos here.